Blue Underground Brings Shock Waves Back to Theaters! With the arrival of Ken Wiederhorn’s Shock Waves on Blu-ray, distributor Blue Underground is bringing the ’70s horror film back to the big screen to celebrate its 40th anniversary. It is doing so with a brand-new DCP and you’ll find a complete breakdown of theater listings below. Starring Peter Cushing, Brooke Adams and Luke Halpin, the film is pre-dates films like Dead Snow and Frankenstein’s Army, offering horror fans some early Nazi zombie terror. 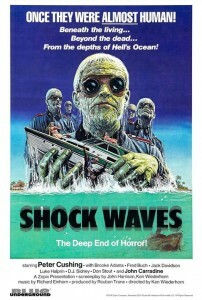 Shock Waves hits Blu-ray and DVD on November 25th. Check out a trailer and specs here.